ComInTec torque limiters (safety couplings) are mechanical components necessary to fit along the kinematic chain and are preferred to electronic safety devices because of a better response time, improved reliability, excellent configuration flexibility, easy fitting and adjustment, use at high speeds in hard environments in the presence of inertias and important masses. In fact the electronic systems, which normally act up to the transmission, present: delayed reaction time, many factors as a source of error, configuration and management complexity. The fitting of the mechanical torque limiters along the kinematic chain is therefore necessary for a reliable and complete protection, in order to improve the level of safety and the machine, according to the new EN ISO 13489-1 standards, reducing the average possible broken-down and unproductive downtime. Long product life with continuous reliability. Simple mounting for in-line and parallel transmission. Highly accurate and fast machine protection. Special designs to suit specific applications possible. “DF”: Simple, economical and suitable for dry and dusty conditions. “EDF/F”: Compact and low cost ball version available with sprocket or flange. “DSS or DSR”: High stability and re-synchronising in various positions. Full range of mounting options available. “DSS/SG”: Allows immediate disconnection without any residual torque remaining. “DSA”: Suitable for limiting compression and tension forces on crank mechanisms. “AP”: Possibility of varying the transmission torque during operation allowing for full disengagement with free rotation. Sliding Safety coupling where the transmission component is fitted between two friction rings and slides when the calibrated torque is reached. The minimum required to have a low cost protection. 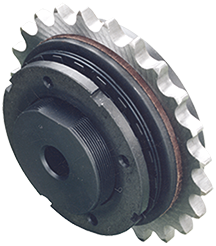 Safety coupling with simple and compact balls inserted directly in the drive element of transmission. The disengagement occurs quickly and safely if the calibrated torque is exceeded. 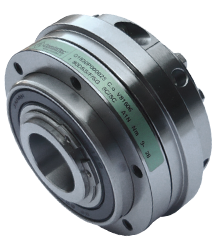 A Roller safety coupling that allows a complete disengagement when the calibrated torque is reached. Suitable for transmitting high torque with high reliability and small size. Ball safety coupling with high technology and backlash free transmission. Device with high sensitivity of intervention, instant and precise disconnection. Backlash free Safety coupling suitable for high speeds, with free rotation and low residual torque after disengagement that occurs in a precisely and immediately. The re-engagement is manual. Modular Safety coupling, robust, suitable for “heavy industries” even at high speeds. After disconnection there is free rotation without residual torque, re-engagement is simple and manual. Safety coupling to be mountedbetween the motor and gear unit thus reducing significantly the size of the device at the same power output. Available in both slip that release versions. Safety coupling with linear limitation of force. The axial disengagement can take place in both compression and tension once the calibrated force is reached, the re-engagement is automatic.